The appearance of our home is always important to us. We all want a beautiful home where we can find comfort and security. 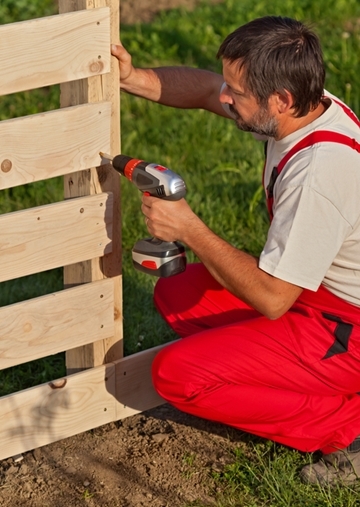 A great way to give a curb appeal to your home and increase security is installing a fence. If you are staying near Florida, opt for one of the best fence installation companies in Florida that provide fence installation, paver installation, lawn designing, and various other services. Go Get ‘em Lawn Service is a leading lawn designing and landscaping company that offers various services like fence installation, planting, landscaping, window cleaning, drainage, tree service, and paver installation. We have trained professionals who are here to provide high-quality fence installation service. Our experienced staff gives you the best advice related to fence installation. Professional fence installation services by our experts can boost the appeal of your home and surroundings. There are different styles of fences available in the market like the wooden fence, chain-like fence, iron fence etc. Our professionals know which type of fence is suitable for your home. No need to worry about the cost as we provide quality fence installation service at affordable charges. Why fence installation is important for your home? Go Get ‘em Lawn Service provides superior fence installation service as we always care for you and we understand your fencing requirements. So, we are there by your side whenever you need us. We value your time and complete our work in a timely manner. Moreover, we offer our fence installation services at an affordable price, and so, you get high-quality services within your budget. Fencing is not just for your security but also to make your home stand out in your neighborhood. We know exactly what you are looking for in your fence installation company and we can fulfill your requirements with our expert services in an efficient way.